Donald and Barbara Bray will be take you on an exciting hunt on private land, encompassing over 12,500 acres. You'll take a Silver Medal game estate red stag, plus a trophy bull tahr and a nanny tahr. You can expect to see world class tahr and Chamois. about our Lilydale Wilderness Area - Red Stag and Himalayan Bull Tahr Combo package. We have designed this to be an all inclusive package giving each hunter a door-to-door experience. 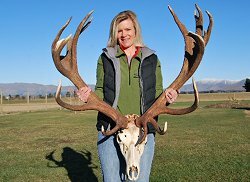 This hunt includes a 1 Game Estate Silver Medal Red Stag plus both a trophy Bull Tahr as well as a Nanny Tahr (the nannies grow horns out to almost 9 inches long). This property has ideal habitat also for Chamois from in the 9 to 10 inch range as well as trophy Fallow Deer and Arapawa Rams.